A conversation with . . .
General contractor doesn't sound very "green." What do you do? I coordinate all the various workers needed to build a house. This job can be green or not-green, depending on how it's done. How many different workers are there? Lots, and getting them all scheduled in order can be tricky. It starts with grading the lot and digging the foundation. Next the concrete foundation gets poured. Then the framer builds the wood structure, followed by the roofer, siding installer, plumber, electrician, heating and air-conditioning specialist, insulation specialist, drywall installer, finish carpenter, cabinet maker, tile setter, flooring installer, painter, and landscaper. Wow, a lot goes into building a house. Is there a green way to do these jobs? Yes, and we are all learning all the time. For example, I am the one to choose the materials and suppliers, and those choices can be green or not green. But, no matter how green those choices, building a house makes a big dent on the environment. How did you learn to be a green general contractor? I have 20 years of on-the-job training, much of it as a master carpenter. And I have a 2-year degree in construction management. Also, I have special training in a program called Leadership in Energy and Environmental Design for homes, or LEED. 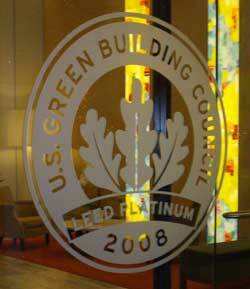 Builders can use the LEED guidelines to build a green home, then have the home rated for how well it meets the standards. So have you built a green home? I'm glad you asked! 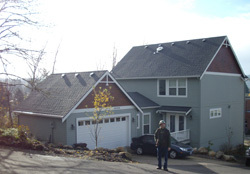 The last home I completed received the Earth Advantages® Silver Award. Like all green homes, it uses less energy, water, and natural resources than ordinary homes. It creates less waste and is healthier and more comfortable for the occupants. 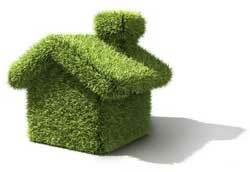 What goes into a new home to make it green? Windows and insulation are really important. Energy Star light fixtures and appliances save a lot of electricity over their lifetimes. There are green choices for siding on a house, as well as flooring. People have to be careful of marketing gimmicks, though, and make sure they are not mistakenly choosing a material that is produced at great cost to the environment-like wood from illegally logged trees in a rain forest! Can houses be built from recycled materials? Yes. For example, eco-fiber carpets are made from recycled plastic soda bottles instead of new nylon fiber. Where do most of the materials come from? We try to pick locally produced products like windows, roofing, and decorative trim for doors and windows, instead of products that have to be shipped all the way from India and China. I've seen a lot of trash around building sites. What do you do with all of that? Building anything produces tons of trash. Drywall scraps are recycled into new drywall. Wood debris is made into composted yard mulch. Cardboard and packaging goes to a paper mill for fiber, and metal gets sorted and shipped to a smelter for reuse. So, your career shows us that a lot of different kinds of jobs can be done in a green way, without actually being "green careers," right? Right. Maybe any job can be done with more thought for the environment. Thanks, Blaine, for giving us a peek inside your green career and your green-thinking brain! 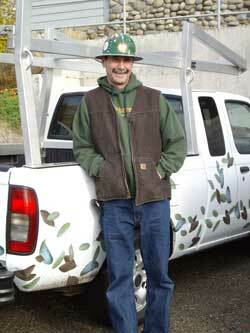 The leaves painted on Blaine's truck are symbols of his concern for the environment. This is one kind of green house, but not exactly the kind that Blaine builds. This is one of the green houses that Blaine has built. 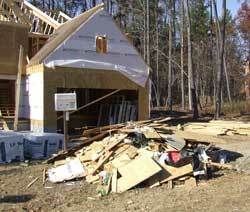 Building a house creates quite a lot of debris, most of which can be recycled. This building has earned the Leadership in Energy and Environmental Design for homes, or LEED, Platinum Award (the very highest). Play "Power Up!" and see if you can get good enough to win a Platinum Award!